Set along the banks of Koggala Lake in south Sri Lanka, Koggala House is a newly built boutique hotel enveloped by rice paddies, cinnamon plantations and towering coconut trees. The small coastal town emanates a serene charm and offers just the right environment for a restful getaway. 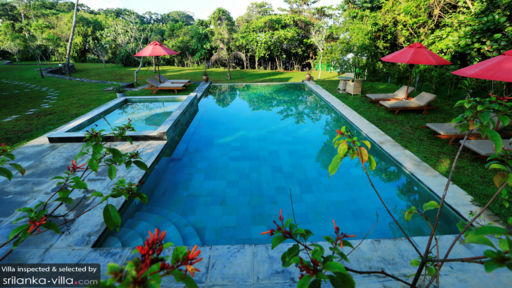 Containing a total of four bedrooms, Koggala House is ideal for accommodating travelling parties of eight. 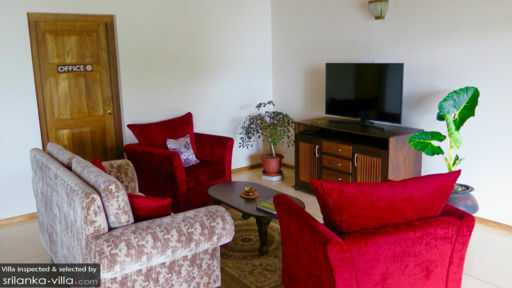 Eight guests are comfortably accommodated in four bedrooms. Each room features an en suite, generous storage spaces, air conditioners, ceiling fans, sofas or armchairs, writing desk, safe, mini bar and tea and coffee making facilities. A shaded, expansive veranda outfitted with outdoor furniture extends out of each room, providing guests with a quiet space of their own to meditate, read or catch a stunning sunset show. Two of the rooms are equipped with bathtubs and sofa beds, and one of the bedrooms features an outdoor shower and private garden. 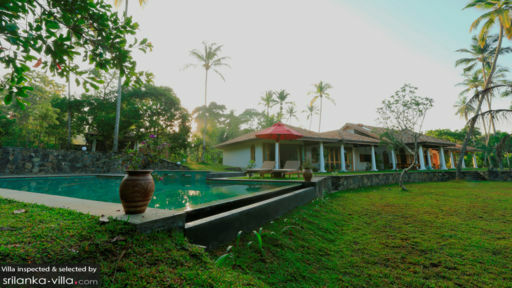 The lush, sprawling grounds of Koggala House offer ample space for group gatherings or private relaxation. Sink into the sparkling pool to cool off from the heat (a shallow wading pool offers a child-friendly alternative for young travellers), or recline upon a lounger set under the shade of the patio umbrellas if you’d rather keep dry. Amenities like an outdoor dining set, sofas, seats and music help set the stage for al fresco dining. This handsome holiday home boasts Dutch colonial-style features like towering columns, lofty ceilings and terracotta floors. Far from being dated, the home is given a contemporary feel with a range of modern furnishings and fittings. The main building houses a capacious common area with exposed timber ceilings, terrazzo flooring, satellite TV, sofas and accent chairs. It extends out to include a well-equipped kitchen, bathroom and laundry, as well as an office that offers a conducive environment for reading or catching up with work matters. Mahesh, the in-house chef prepares a daily breakfast, lunch and dinner from an ala carte menu that’s updated daily. Other staff members at Koggala House include Chamara (housekeeper), Freddy and Sugath (security). Laundry services, driver and car, tuk tuk or boat hire are available at request. Yoga classes, surfing lessons, massage services and Ayurvedic medicine treatments can be arranged at your villa or in a different location. Beach-goers will enjoy the pristine white sand coasts of Kabalana (15 minutes’ drive), a beach known for its safe swimming and surfing. Stroll along the beach for a glimpse of the renowned stick fishermen of Sri Lanka. Galle Fort, a UNESCO World Heritage Site is 45 minutes’ drive from your villa. A walking tour is a great way to take in the sights of the town while discovering interesting snippets of its history and culture from your guide. For a dose of cultural sightseeing, stop by attractions like the Dutch Reformed Church, Martin Wickramasinghe Folk Museum and Japanese Peace Pagoda. Your villa manager will readily assist with tour arrangements. Family-friendly attractions that come with our recommendation are Dondra Point (an hour’s drive) or Mirissa (43 minutes’ drive) for whale watching, Turtle Watch Rekawa (two hours’ drive), Handunugoda Tea Factory (16 minutes’ drive), Yala National Park (three hours and 20 minutes’ drive) and Kalametiya Bird Sanctuary (two hours’ drive). Koggala House was everything I was hoping for and more! We had just been travelling as a group around Sri Lanka and were hoping to get down to Koggala House and relax...! We had an absolute ball, it is very peace and quiet and had gin and tonics at 5pm on the deck each day. The rooms are immaculately done, the owners have gone all out on this. The Chef had done his trade in Brazil and France and was amazing. Each night we had 3 courses overlooking the lake. The managers also organised for us to go on the Whale watching tour of the blue whales down at Mirissa and got us VIP seats on the boat. We also ventured into Galle to see the fort and other beach areas. Overall its a perfect stay for a group of people who are keen to relax and get first class service. I will be definitely coming back to Koggala house!